If you have never considered brushing your cat’s teeth before, you can probably already guess that it is not going to be an easy task. However, if you want to protect your feline’s pearly whites from plaque and tartar build-up, tooth decay, and gum disease, this is one of the best ways of doing so. If you decide that you are going to brush your cat’s teeth, you are going to need a cat toothbrush. You may be thinking: how hard can it be to buy a toothbrush? Well, just like human toothbrushes, there are a host of products out there, and each one has its own individual set of qualities which you need to assess. Don’t worry; we are here to help. We have selected 10 of the best cat toothbrushes for you to choose from in our easy product guide below. Made from a high-quality material, these finger brushes are soft enough to clean your cat’s teeth without aggravating them. Unlike similar products on the market, they have a curved profile which allows them to access difficult-to-reach areas around your cat’s mouth. Detailed instructions are included, so you can feel comfortable cleaning your cat’s teeth, even if you have never tried before. Get used to brushing your cat’s teeth on a regular basis, and you will help to stave off the common signs of tooth decay. This big pack of toothbrushes included four dual-headed brushes and four finger brushes. The variety of brush heads included gives you plenty of tools to give your cat’s teeth a proper cleaning. The material is soft enough to not cause any damage to your cat’s mouth. With the finger toothbrushes, all you have to do it slip them on and you can get to work. Of course, you should make sure that you read the guidelines carefully and/or watch videos to ensure that you know what you are doing. These dual-headed brushes simplify the task of cleaning your cat’s teeth. There is a large and small brush head on each end, which means that you are not having to constantly switch between different brushes. Buy the six-pack of brushes and this gives you a year’s worth of daily brushing for your feline friend. You can rest assured that the hardness of the bristles has been optimized not to harm your pet. Two colors are included, so you can assign them to different pets if you need to. Rated highly by cat owners, this pack of brushes includes six finger toothbrushes and two dual-headed, long-handled brushes. Made from high-quality materials with soft bristles, your cat’s health and safety have been closely considered. 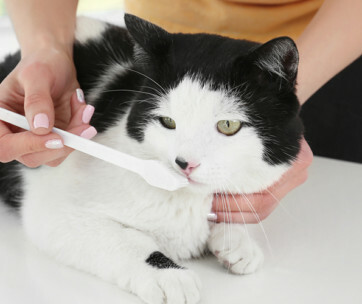 Most cat owners prefer the finger brushes for the day-to-day oral hygiene needs of your cat, but the longer brushes are ideal for reaching the spots which you couldn’t otherwise get to. This combo pack ensures that you have the tools to brush your cat’s teeth for many months to come. A brush which has been specifically designed with more petite pets in mind, the brush head is small, and the bristle height is shortened to make it suitable for your kitty’s mouth. The bristles are ultra-soft and polished to help remove plaque from your cat’s teeth without causing damage to their gums. Complete instructions are included to help you get started if you have never brushed your cat’s teeth before, helping you to get into the habit of cleaning them on a daily basis. If you have a passion for environmental protection, why not go for one of these bamboo pet toothbrushes rather than the plastic models? The handles are entirely biodegradable and will decompose naturally. As for the bristles, they are designed specifically to be soft enough for use in your pet’s mouth. A small hump at the back of the handle ensures that you can get a good grip on it, so you are comfortable when brushing your cat’s teeth. A differently designed brush to the ones which we have already discussed, this one features a 360-degree head, so you don’t have to worry about continually twisting and turning it in the right direction. The ergonomic handle design makes it comfortable to grip. The bristles are highly soft, and there are as many as 10 times more than traditional brushes. As well as being able to remove plaque and food particles effectively, you can also massage your cat’s tongue, teeth, and gums. A simple and affordable product, the handle of this Cet cat toothbrush is long, while the head is small enough to comfortably fit inside your cat’s mouth. Get some specially formulated cat toothpaste, learn the basics of brushing, and start using the brush on a regular basis. This is one of the most effective ways of fighting back against bad breath and tartar. This multi-angled brush allows you to brush the surface of your cat’s teeth with minimal fuss and hassle. The micro-thin bristles are specially designed to offer a gentle and thorough brushing experience. The 15-degree angle bend makes it suitable for smaller pets, and it has been tested to fit the mouths of smaller pets. You can reach areas which would be very challenging to access with other brush varieties. Finally, we have another 360-degree pet toothbrush which allows you to brush your cat’s teeth from any angle. 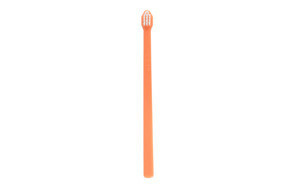 This stops you from having to constantly twist and turn the bristles to reach the right angle. The handle is in a textured shape which makes it easy to grip. Remember to wash and dry the brush after every single use to ensure that it remains at its most effective. Now you have an overview of some of the best cat teeth cleaning products currently available, you can start to look in a little more detail at a few of their core features. The main types of brushes are handled, dual-headed, 360-degree, and finger brushes. Each has its own set of pros and cons, which we will look at in one of the following sections. So, scroll down the page if you are seeking more information now. The size and shape of the toothbrush head should depend on what sort of cat you have. Generally, you are not going to want a brush with a big head unless you have an especially large kitty. Cats don’t like to open up their mouths too wide, and a smaller brush will slip in easier. The shape could also factor into your decision-making process. Round heads make it easy to clean each tooth thoroughly, but oval-shaped brush heads can help in scrubbing adjacent teeth simultaneously. While the bristles shouldn’t be too hard, you also don’t want them to be too soft either. The extra-soft brushes tend to not be as effective in removing plaque which just won’t seem to shift. But you should also avoid those which are too hard as these are likely to irritate your cat’s gums. Ultimately, it is a balancing act between ensuring that the brush is tough enough to dislodge debris, while still being soft enough to not cause your cat an oral injury. The softness is quite similar to a baby toothbrush, but a specially designed cat brush will have a smaller head. Cats have much smaller mouths than dogs, so you may find that a brush handle which is too straight proves to be a problem, as you cannot manoeuvre it as easily. Finger toothbrushes give you much more scope to hook around your cats’ teeth and reach the places which you otherwise would not be able to access. 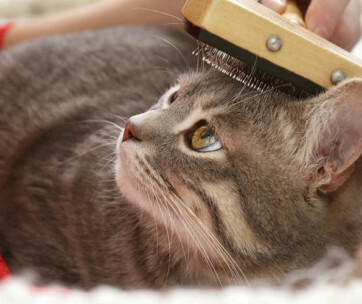 If you would prefer not to reach into your cat’s mouth, you should choose a brush head which offers a good angle at its neck. Obviously, if you choose finger brushes, there is no need to worry about the handle length. However, if you go for the more traditional variety, you need to consider how the handle length is going to impact your brushing ability. Go for one which is too long, and the brush movements will be difficult to control, and you are at a greater risk of choking your cat. Choose one which is too short, and you will end up putting your hands in your cat’s mouth, which is exactly what you were trying to avoid in the first place. While many cat owners never really consider brushing their cat’s teeth, there are plenty of benefits which make it a worthwhile activity. While cats don’t have the same sugar-rich diet of humans, they are not able to look after their own dental hygiene in the same way as we can. Just like us, they will build up a layer of plaque and bacteria over time. Tooth decay is the most obvious issue which can arise, but there are plenty of other more serious conditions which can occur due to poor dental hygiene. Other issues include gum disease and gingivitis. If left untreated, these diseases can have a negative knock-on effect. The infection can spread around the body, damaging your cat’s kidneys, and, at worst, leading to organ failure. If you brush your cat’s teeth on a regular basis, this can help to improve the health of their teeth and gums. While cat teeth don’t accumulate as much debris as human ones, there are still certain areas where it can gather. Dental treats can help to clear some of the debris, but a toothbrush can help to reach whatever is missed. Removing food particles, debris, and dried-up saliva will help to prevent the formation of plaque and tartar. If you take these preventative steps to start off with, this will stop you needing to remove these substances further down the line. The knock-on effect from allowing plaque and tartar to build up is the development of tooth decay. While this process doesn’t happen overnight, germs will gradually eat away at the enamel of their teeth. And because the cavities are often the same color as the teeth, you may not notice that they are forming. But if you clean your feline’s teeth on a regular basis, you can prevent this decay from developing in the first place. Brushing your cat’s teeth on a regular basis should form an integral part of their dental regime. You should also visit the dentist annually as they can spot signs of tartar and gum inflammation. Providing things for your cat to chew can also help significantly. Kitten toothbrushes are relatively inexpensive, and if you keep up with brushing your cat’s teeth on a daily basis, they will save you a lot of cash in the long-run. Professional dental cleaning is an option which many people take, but it can get quite expensive. And if you don’t do anything at all about your cat’s dental hygiene, you are eventually going to have to take them into the vet to have teeth removed, which will cost you a bundle each and every time. Also, with either one of these options, there is the stress of having to put your feline in a cat carrier and drive them in the cat. Not only this, but there is also the risk of sedation to think about too. As we mentioned earlier in the blog post, there are several different types of cat toothbrush available. The one that you choose to go for should depend on your cat, as well as your own preferences. As it suggests in the name, cat finger toothbrushes fit over your fingers, allowing you to manoeuvre around your cat’s teeth easily. Essentially, they resemble a rubber thimble with bristles molded on. Control is also easier, and you don’t have to worry about bothering your cat by shoving a long handle in their mouth. Some people find that a finger toothbrush is a good stepping stone to using a regular toothbrush on your cat. However, for many cat owners, the idea of putting their hands inside a cat’s mouth is not an appealing one. And this is especially the case if your cat has a tendency toward biting. The ‘traditional’ type of cat toothbrush is one which is shaped like your own. However, the brush head will be smaller to easily fit inside the mouth of your feline. Also, the bristles are softer to ensure that no damage is caused. They are quite similar to toothbrushes for babies, though you are better off buying a specially designed cat toothbrush as the heads are usually even smaller. 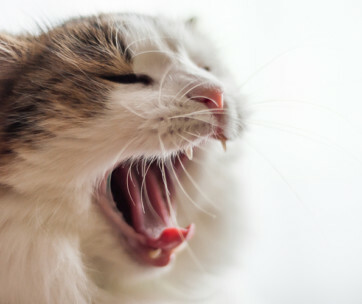 Cats don’t enjoy having their mouths open wide, so if you get a thin brush head, this will help you to get it in their mouth without disturbing them too much. Shaped like a standard toothbrush, a 360-degree brush has a circle of bristles. This enables you to clean your cat’s teeth at any angle rather than having to twist and turn the brush to make sure the right side is on your cat’s teeth. Since many cats don’t like anything in their mouths, this allows you to clean their teeth quickly before they try to get away. The other main type of cat toothbrush is one with a head at either end. The two heads are usually different sizes, so you can choose which one is best to fit inside your cat’s mouth. They are a good option for a household with more than one pet. Many people prefer one which has a long handle as this offers you extra control and ensures that you don’t have to put your hands near to your cat’s mouth and risk getting bitten. Q: Can you use a human toothbrush on your cat? A: You should never use an adult toothbrush on your cat. The brush head is too large, and the bristles are too tough. Some people decide to use children’s toothbrushes on their felines as they also have highly soft bristles and small cleaning heads. On the downside, they have straight handles, which means that they are more challenging to move around in your cat’s mouth. Pet toothbrushes have been specially designed for the task in hand with angled handles to access all surfaces, so for a low investment, you can get a product which is meant for your cat, rather than risking using one which isn’t. Q: Can cats get cavities? A: Just like human beings, cats can also get cavities. But they are not the same black holes that we get on our teeth. Usually, they are the same color as the tooth itself and are the result of tooth resorption. The official medical name for them is feline odontoclastic resorption lesions (FORLS). The number of cats suffering from this issue has increased significantly over recent years. There are a variety of factors which have been attributed to this rise including dietary changes. Q: What else will I need for brushing my cat’s teeth? A: As well as your cat’s toothbrush, you will also need a toothpaste which has been specially made for cats. Don’t use a regular human brand of toothpaste as this contains chemicals which could be harmful to your feline friend. While we spit out the paste, cats swallow anything which is inside their mouth. You don’t want them to end up getting an upset stomach. 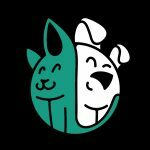 As we talked about earlier, not every cat will be thrilled about the idea of getting their teeth cleaned, so having someone else with you to provide your pet with reassurance and keep them still while you are undertaking the task will also help a great deal. If you have never brushed your cat’s teeth before, this is an activity which is going to take time. Start slowly by massaging their mouth every day. Next, you can allow them to lick some toothpaste off your finger. After this, you can then try using a finger toothbrush on them. This step may take a bit of time before they are entirely comfortable with it. The final stage is to use a regular bristle brush. Over time, you should start to establish a routine which works for you and your cat. Q: When and how often should I brush my cat's teeth? A: You should try to pick a time when your cat is feeling calm to brush their teeth. If your cat sticks to a regular routine, and they feel sleepy or drowsy at a particular time of day, this is ideal. Often, this comes soon after your cat has eaten. You may find it easier to brush their teeth when they are completely asleep. If you choose the same time each day, this helps your cat to get used to what is going on. As to the question of how often you should brush them, ideally, this should be done on a daily basis. Bear in mind that plaque is building up on the walls of your cat’s teeth all the time and needs to be removed regularly. If you feel like once a day is an unattainable goal, three times per week is a good amount. Any less frequently than this, and you could be doing more harm than good. First of all, it will not be as effective as tartar is very difficult to remove. Secondly, it can end up being stressful to a cat who is not used to it. Finally, you will not be in the habit of brushing their teeth, and you are less likely to develop the proper techniques. Q: Can I use an electric toothbrush for my cat? A: The initial answer is yes; you can use an electric toothbrush on your cat. However, you need to ensure that the bristles are the correct size. If possible, try to choose a quiet variety of brush. If it is too loud, you could find that your cat ends up getting startled. You will need to introduce this type of brush over time as it is unlikely that your cat will get used to it straight away. 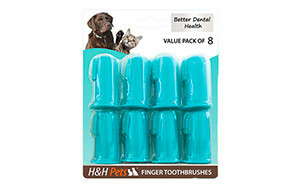 Out of the 10 products we discussed above, our number one pick is this set of finger toothbrushes from H&H Pets. Made from high-quality materials, the bristles are soft enough to ensure that you can brush your cat’s teeth without causing them any harm. Unlike some other cat toothbrushes, the bristles have been designed with a curved profile to clean hard-to-reach spots in their mouth. This pack of eight ensures that you have the tools that you need to brush your cat’s teeth for many months to come. There is a 60-day money-back guarantee if you are not entirely satisfied with your purchase. For all these reasons and more, we have ranked it at the top of our list of cat dental care products.